British potatoes. Triple cooked luxury beef dripping.With the finest crops, we always cut from whole potatoes and prepare with love and care using real, simple ingredients and no artificial colours or preservatives. Made with 100% British potatoes for everyone to enjoy! For a crispy golden finish these chips are cooked in beef dripping & vegetable oil so please use a Deep Edge tray. 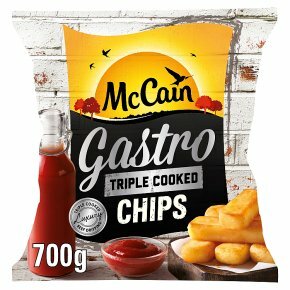 Here's how to cook 500g of McCain Triple Cooked Gastro Chips. If cooking a different amount, adjust the cooking time accordingly.To get the best results cook from frozen, our instructions are guidelines only. For the most delicious results, do not overcook!Already twice cooked in our McCain kitchen, then once more in yours for extra deliciousness!Preheat the oven to 230°C/220°C Fan/Gas Mark 8.For best results use a Deep edged baking tray Without Holes and preheat the tray for 5 minutes.Spread a single layer of chips onto a baking tray and pop it into the top of the oven.Bake for 25-30 minutes, turning them every now and again, until they're lovely, crisp and light golden.Take Care: The fat will be Hot!